The termites you may see as dark brown nests high up in a tree are seldom pests of significance. 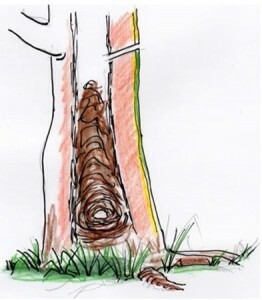 But the main subterranean termites that do that 99% of the damage we mentioned earlier, will often nest inside the central ‘pipe’ or hollowed-out heart of a mature tree. Mastotermes or Mastos, (generally found only North of the Tropic of Capricorn) don’t always wait for the decay of the pipe. They kill palms and healthy mango trees. If you have a large eucalypt, peppercorn or a mature fruit tree nearby, you should check it. Use an 15-20mm diameter auger bit long enough to drill into the centre of the trunk at about shoulder height. Drill at a slight downward angle and when you feel less resistance it will be because you have reached the pipe. As you pull the bit out, look to see if any termites are in the fluting. If not, you could slip in a long thin grass leaf into the drill hole, leave it there for a minute and withdraw it slowly. Termites may be found holding on, ‘attacking’ it. 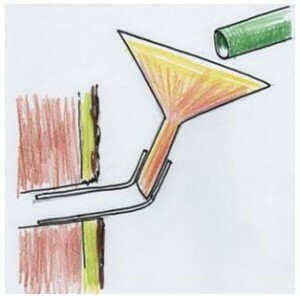 If still no live termites are found, come back in half an hour or next morning; if there is termite life inside, they will be repairing or have repaired the drill hole using their ‘mud’ mixture. Using a funnel, plastic tube and watering can/bucket, pour at least 30-40 litres of a permethrin or a bifenthrin solution down into the tree. These insecticidal concentrations can be purchased from a local hardware store. They may be known by various brand names but the active ingredients are shown on the front panel of the label. They are insecticides and you should read the label for dilution and safety directions.